The ‘I AM S.O.C.A.’ Clothing Store, endorsed by some heavy weights in the Caribbean music industry has launched a new website featuring a host of innovative designs. As of January 1st, 2015, supporters of the I Am S.O.C.A. movement can expect more exciting disclosures from the pioneering entrepreneurs behind this effort. Founded in 2012, the ‘I AM S.O.C.A.’ movement began as an event headlining Kerwin DuBois (the brain child behind the soca hit ‘I Am S.O.C.A ’ featuring Patrice Roberts) . Co-founder, Stephen Phillip, created high quality t-shirts to promote the event and the response was overwhelming. He joined forces with three other team members to build even more momentum behind the line, and they have grown exponentially since then. The movement has expanded to include several product offerings including its’ core t-shirts featuring the lyrics of many popular Carnival songs. 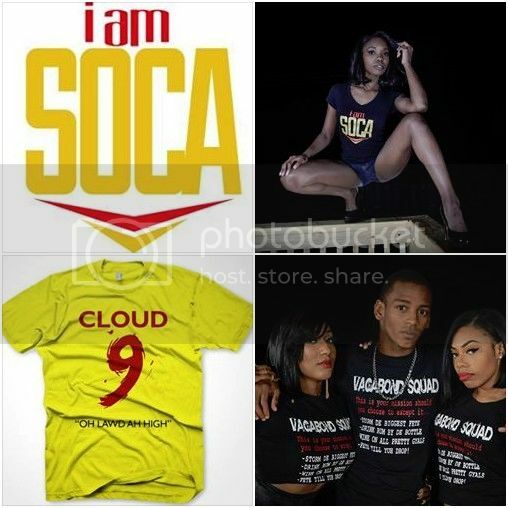 Soca artistes such as Allison Hinds, Lyrikal and Ricardo Drue to name a few, have all jumped on board the I AM S.O.C.A. train, citing its commitment to not only high quality fashion but to promoting Caribbean culture as the reason for their respective endorsements. The mission statement of this movement, according to C.E.O. Stephen Phillip, is ‘To Build a Quality Brand that will Support, Educate, Inspire and Unite.’ With this in mind, the team stays committed to its long-term goal of ‘becoming a household brand recognized for its high quality& commitment to culture. According to Chief Technology Officer, Levar Gordon, ‘This movement is designed to get international exposure for all things cultural. Here at our headquarters, we define S.O.C.A. as soul of cultural art, which essentially means that anyone who loves culture & the arts in any of its manifestations can connect with what we are doing.’ Designs for I am S.O.C.A are available online at www.iamsocaclothing.com or at the M Store at Piarco International Airport in Trinidad & Tobago. Founded in 2012, the I AM S.O.C.A clothing store is a subsidiary of D.J. Stephen Music. The movement began as an event headlining Kerwin DuBois (the brain child behind the soca hit ‘I AM S.O.C.A ’ featuring Patrice Roberts) . Co-founder, Stephen Phillip, created high quality t-shirts to promote the event and the response was overwhelming. He joined forces with Chief Technology Officer, Levar Gordon; Chief Operation Officer-Debrandon White, Leo Ewing- Investment Capital Director to expand the line further. The movement has grown beyond its staple t-shirt designs featuring the lyrics of many popular Carnival songs.